About Siskiyou Development Co., Inc. When Frank and his wife Gene Rizzo purchased the Pilgrims' Rest Motor Coach in 1951 it was a quaint little stopping place on Highway 99 with little cottages. On the main road was the owner's residence and check in office for weary travelers. Siskiyou Development owner Margaret (Rizzo) Dean said that one of the first things her father did after purchasing the business was to remove the cottages on the upper level and replace them with the present 17-room section. Eventually two more sections were built to a total of 41 rooms. Most rooms offer a wonderful view of the majestic Mount Shasta and its year round snow covered glory, serving the same repeat travelers year after year. The Hi-Lo Motel, Café and RV Park have expanded to over three acres on South Weed Boulevard. The complex now has 41 motel rooms, four apartment suites, a recreational vehicle park and a full service family restaurant. On the lower part of the property, Boles Creek provides a pleasant place for a picnic area and RV camping spot. Dean said that she bought into Siskiyou Development in 1971, after growing up learning all facets of the business. The Corporate office is located directly across the street from the Hi-Lo Motel & Café and has grown to be one of the largest employers in Weed. 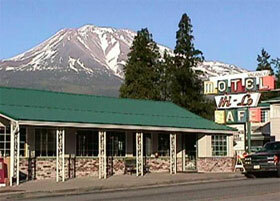 Besides the Hi-Lo Motel, Café and RV Park, Siskiyou Development operates three convenience stores- in Weed, Yreka and Mt. Shasta. Click here for condo rental information in Maui, Hawaii.